Dalacin T Topical Lotion is a white to off-white aqueous emulsion containing the active ingredient Clindamycin Phosphate. Clindamycin is an antibiotic used to treat acne. It works by killing a wide range of bacteria which contribute to acne. Dalacin T is available as a lotion or a solution, depending on your skin condition. The Dalacin T Topical Lotion is best used for those with dry skin. Dalacin T Topical Lotion should be kept out of reach and sight of children. It should not be stored above 25 degrees celcius. When using Dalacin T Topical Lotion, you should follow the instructions given to you by your doctor. The affected area should be washed and a thin film of the lotion applied. Gently rub the lotion into the skin. Replace the cap after every use. If you miss one or two applications, don't worry. Carry on as soon as you remember. You should not stop completely using the Dalacin, even after the acne starts to get better, until directed by your doctor. The active ingredient in Dalacin T Topical Lotion is clindamycin phosphate. 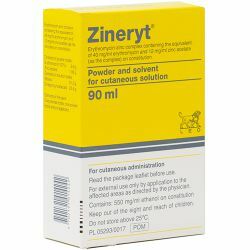 Other ingredients include glycerol, sodium lauroyl sarcosinate, stearic acid, tegin, cetostearyl alcohol, isostearyl alcohol, methylparaben and water. 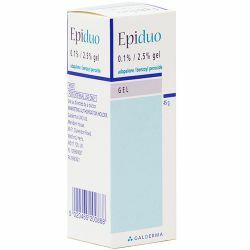 Dalacin T Topica Lotion should not be used if you are allergic to any of the ingredients in the medicine or if you have a history of inflammatory bowel disease or antibiotic associated colitis. You should not use the Dalacin T Topical Lotion if you are using other skin treatments containing the ingredient benzoyl peroxide. You should make sure to mention if you are taking any other medicines, including medicines obtained without a prescription. If you are pregnant or think you might be pregnant, you should speak to your GP before using Dalacin. You should tell your doctor if you will be breast-feeding while using Dalacin T as the active ingredient may be passed into breast milk. Although it is not likely that a nursing infant will take in very much of the active ingredient from the milk it drinks, if your baby gets bloodstained diarrhoea or shows any signs of illness, tell your doctor at once. 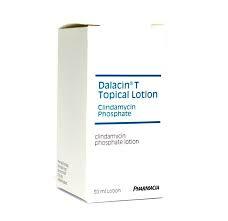 Dalacin T Topical Lotion contains cetostearyl alcohol which may cause local skin reactions such as dermatitis. As with all medicines, Dalacin T Topical Lotion can cause some side effects, although not everybody gets them. If you find that you are getting some of these effects, you should speak to your GP. You must tell your doctor immediately if you develop severe, persistant or bloody diarrhoea. It is an uncommon side effect which may occur after treatment with antibiotics and can be a sign of serious bowel inflammation. Other common side effects are as follows can be skin irritation or hives and oily skin. Also, some side effects which may occur, with unknown frequency are gastrointestinal disturbances, with symptoms such as diarrhoea and nausea, and severe acne.